Fig. 1 and 2. Fly; fly wing. Location in book: Facing verso of Schem. XXIV and preceding p. 183. Plate title: Schem. XXVI. References in text: Fig. 1 described in "Observ. XLII. Of a blue Fly," beginning p. 182; Fig. 2, depicting "one of those wings," described p. 184. Hooke, Robert. Micrographia, or, Some physiological descriptions of minute bodies made by magnifying glasses. London: Printed by Jo. Martyn, and Ja. Allestry [etc. 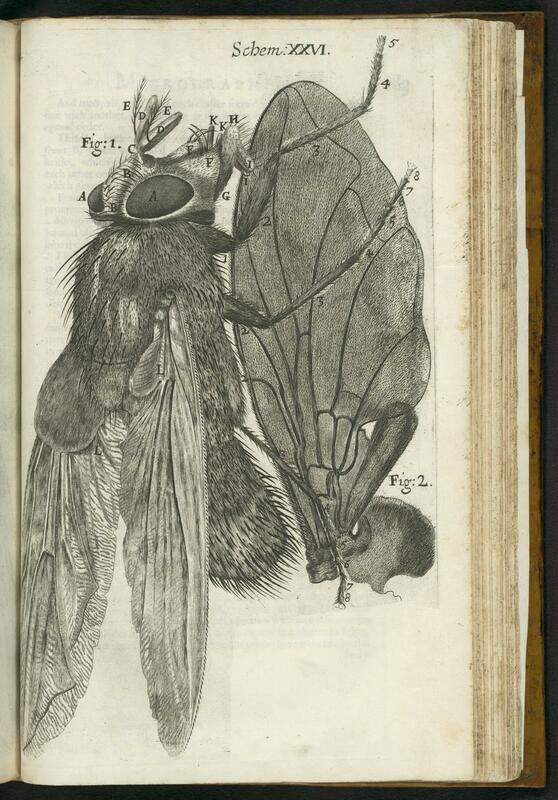 ], 1665. Gift of Daniel and Eleanor Albert.